While midmarket organizations have the same needs as enterprises for app performance and data protection, they often suffer from greater constraints on budgets and staffing. The same goes for remote offices. Because many storage technologies are complex and can be hard to manage, there is a clear need for a midrange solution designed for simplicity and ease of use, but with enterprise-grade performance and features. 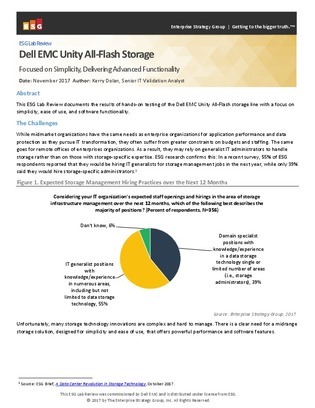 This ESG Lab Report examines the results of hands-on testing of one such solution, the Dell EMC Unity All-Flash storage line, with a focus on simplicity, ease of use, and software functionality. Read on for the complete results as ESG unboxes this flash array.